Going through chemo is rough. 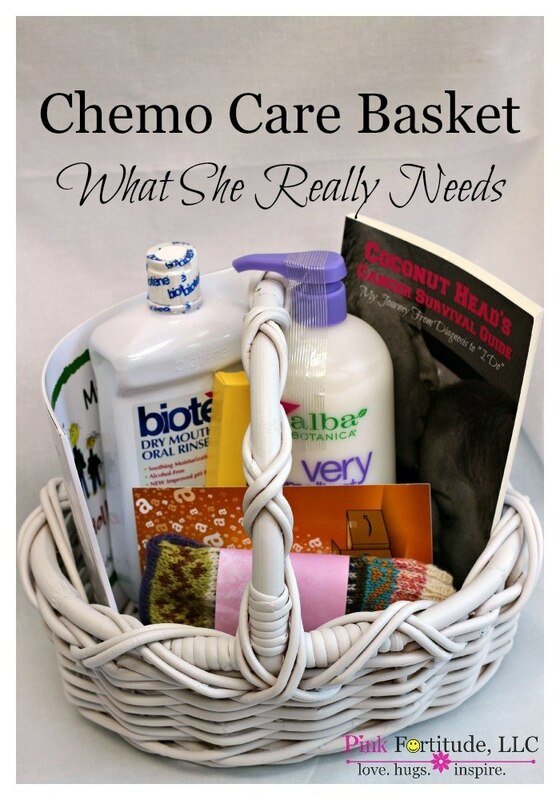 These are eight items that a cancer patient could really use while going through chemo treatment. These items may not be glamorous, but they are practical, and will be greatly appreciated. 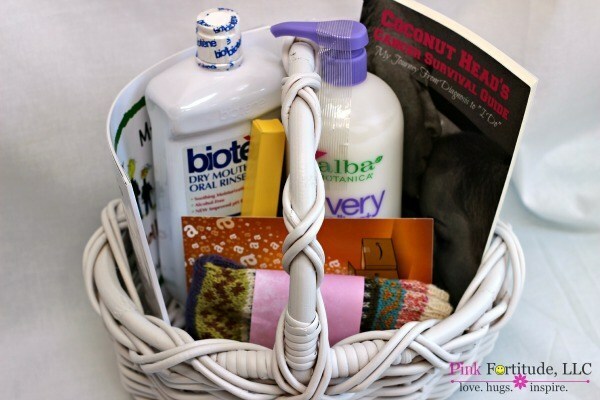 This exact chemo care basket was donated to our hospital’s breast cancer silent auction to raise money for their program. I’ve since updated some of the items. When you are going through chemotherapy, people want to DO something. They want to give you things to take away the pain. That is all well and good, but during chemo, daily survival is pretty much all we think about. If you lose your hair while going through chemo, your head gets cold when you sleep. A soft chemo cap makes sleeping a little more comfortable. Chemo does a number on your mouth. Your mouth tastes like metal, your taste buds don’t work, and your mouth becomes really dry, which causes another list of issues. Biotene is gentle and was highly recommended by my oncology nurse. This post-mastectomy breast cancer hoodie sweatshirt with drain pockets is an affordable, comfortable way to manage drains post-mastectomy, or any other surgery that may require them. Pink Fortitude’s signature product – Gratitude Builds Fortitude Journal. Your choice of gorgeous designs and lined or dot grid for bullet journaling. It’s an unfortunate side effect of many chemo treatments, not only do you lose your hair, but also your eyebrows and lashes. Your eyebrows frame your face, and are easily “fixed” with a little makeup. I LOVE the Beautycounter all natural and organic line of makeup. During chemo, your skin gets extremely dry. And not just dry, but that uncomfortable, itchy dry. I LOVE Beautycounter’s Hydrating Body Lotion. Often when going through treatment, your sense of smell is on overdrive, and even the slightest fragrance is bothersome. An unscented or lightly scented lotion is ideal, and extra bonus when it’s all natural! This lightweight, fast-absorbing body lotion that contains a moisturizing blend of marula, mongongo, and safflower seed oils, plus shea and jojoba butters. During the course of cancer treatment, regardless of what it is, and how long it is, there are many people who will do nice things for the patient. Custom thank you cards in a cheery design will allow for the message to be personalized, yet not cause undo effort for the patient. PS – Shaina, the owner of the shop, has been my exclusive “card girl” since 2015! The writing is raw – it is an uncensored view of breast cancer treatment and what it’s really like. Holly uses humor and laughter to redefine beauty as she loses part of her breast, all of her hair, and is launched into early menopause. 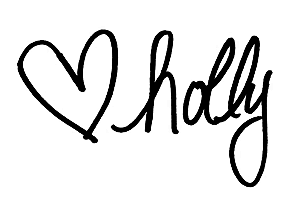 With pop culture references and her quirky sense of humor, Holly’s heartwarming story of love and strength is an encouragement for all women going through cancer treatment. My Mommy Has Cancer was written to help your family heal. This children’s book was written from a child’s perspective to talk to another child about cancer. It is age appropriate for five to ten-year-old children. Parents are encouraged to read through the book first, and then read the book to or with your child and have an open discussion that is best for your family’s situation. Topics include what is most visible to children: surgery, chemotherapy, hair loss, schedule disruption, feeling sad, and helping. Break-out boxes contain probing questions to help your child talk openly about their feelings and concerns. Hours and hours of chemo, hours and hours of not feeling well and laying in bed or on the couch. Nothing says BEST.GIFT.EVER. more than a gift card to Amazon.com so they can purchase books (real or electronic) to pass the time. On that note, you can even pay for a year’s subscription to Amazon Prime, Hulu, or Netflix so that your loved one can stream movies and TV shows on her phone or tablet while in treatment and at home resting. Thank you. Thank you to my dear readers. Thank you for those who have shopped from my site. Thank you to those who have become loyal followers and part of our Pink Fortitude family. You aren’t just reading a blog post or purchasing a product, you are giving back and this is just one example of how your support helps. If you ever want to connect, we are always here to chat! I could not get the links to ebay store and Fortitude Collection to open. Says page not available. What a wonderful gift basket, Holly. I so respect your generosity and focus on helping cancer patients. This is a great idea and one that has gone through a lot of thought. With a mother who passed from Ovarian and Mother-in-law with breast cancer I can really appreciate this. Thanks for sharing at the Tips & Trick Linky Party and have a great week. Great ideas in this basket! Love it! Not sure you knew this about me, but, I used to do wigs at a Breast Cancer store that was set up next to a hospital in FL and this basket is great! Thank you so much for sharing this pin on the P3 party Board! I love it and it will be featured on the blog and my social media Friday! So look for a little traffic from me! I like your suggestions. My sister gave me a guft card to Sephora so I could get new, gentler make up. My skin changed in texture and color during and a bit after chemo. This turned out to be necessary for me since I worked through treatment and still needed to look as good as possible-plus it was a real mood booster!